Two big factors in getting promoted in the Army are your APFT score and your height/weight or body fat percentage. Without passing these crucial parts, you will never get promoted. Use the calculator below to calculate your APFT score and your body fat percentage. After that, head on over to the APFT Promotion Points post for more information on the APFT and how important it is if you plan on getting promoted in the Army. The body fat calculator is only necessary if you do not meet the necessary height and weight standards. 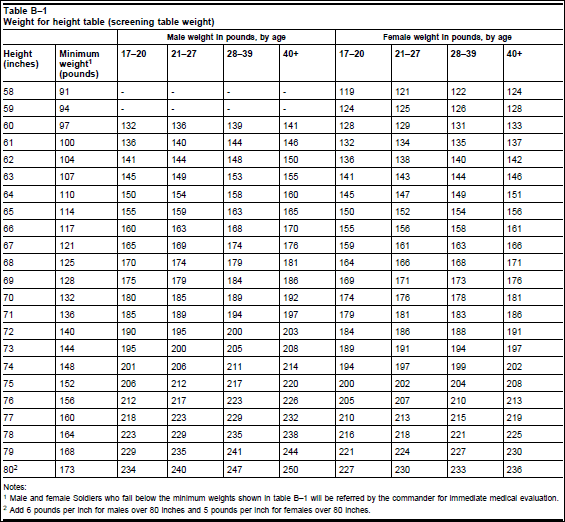 Check the chart below to see where you should be in terms of weight. There are different weights for males and females. Find the column that corresponds to your gender and age, and match it to the row listing your height in inches. This will give you a minimum weight and a maximum weight. If you do not fall into the acceptable range for your gender, height, and weight; below is the body fat percentage standards. Measure the Soldier’s abdominal circumference to nearest half inch. Round down to the nearest half inch. Measure Soldier’s neck circumference at a point just below the larynx (Adam’s apple and perpendicular to the long axis of the neck). The Soldier should look straight ahead during the measurement, with shoulders down (not hunched). Round the neck measurement up to the nearest half inch. Measure Soldier’s neck circumference at a point just below the larynx (Adam’s apple and perpendicular to the long axis of the neck). The Soldier should look straight ahead during the measurement, with shoulders down (not hunched). Round the neck measurement up to nearest half inch. Measure Soldier’s natural waist circumference against the skin at the point of minimal abdominal circumference, usually located about halfway between the navel and lower end of sternum (breastbone). If site is not easily visible, take several measurements at probable sites and use the smallest value. Ensure tape is level and parallel to floor. Soldier’s arms must be at the sides. Take measurements at the end of Soldier’s normal relaxed exhalation. Round the natural waist measurement down to the nearest half inch. Measure Soldier’s hip circumference while facing Soldier’s right side by placing the tape around the hips so that it passes over the greatest protrusion of the glute muscles (buttocks) as viewed from the side. Ensure tape is level and parallel to floor. Apply sufficient tension on tape to minimize effect of clothing. Round hip measurement down to the nearest half inch.